A vertical vegetable garden can be the mind blowing solution to your desire to grow your own food but the problem of a distinct lack of space. Sometimes, you need to look at a problem from a different angle and, when it comes to growing vegetables, that means looking up. Not every vegetable is suitable for a vertical vegetable garden, but even if you can only grow some lettuce and snow peas in your limited space, they’re going to make the best salad you’ve ever tasted. Some of the ideas here can be put into action with items you have on hand or can buy very cheaply from either hardware store or second hand building material. For lots of other great ideas for growing your own food, follow our Grow Your Own Food board on Pinterest. The following infographic is an excellent reference point for starting your vertical garden. Check out your favourite vegetables (‘cos why grow anything else?) and the best method for supporting them. 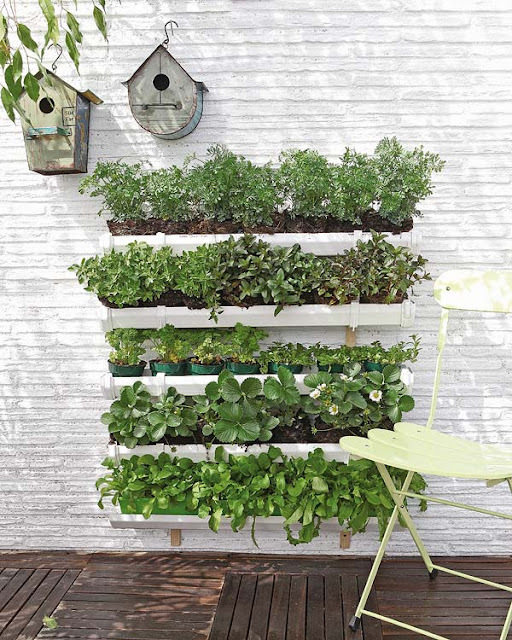 Useful and attractive, this design enables you to create a privacy screen and a source of fresh herbs for your kitchen. The clever arrangement of guttering provides both an abundance of leafy greens for salads and an efficient use of water. 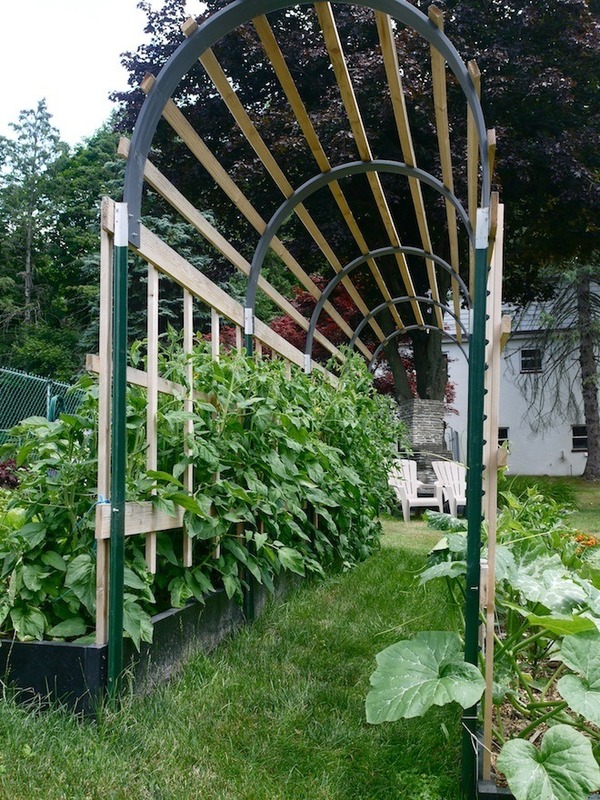 Use recycled metal reinforcement rods and mesh to create an arbour for supporting all sorts of climbing vegetables. An other version of a tunnel, this time over a grassed path enables vegetables to be grown over an area unavailable for planting. A more elaborate series of arches over the paths in a raised garden – attractive and productive. Once again, gutters are used for both direct planting and as shelving for small potted plants. 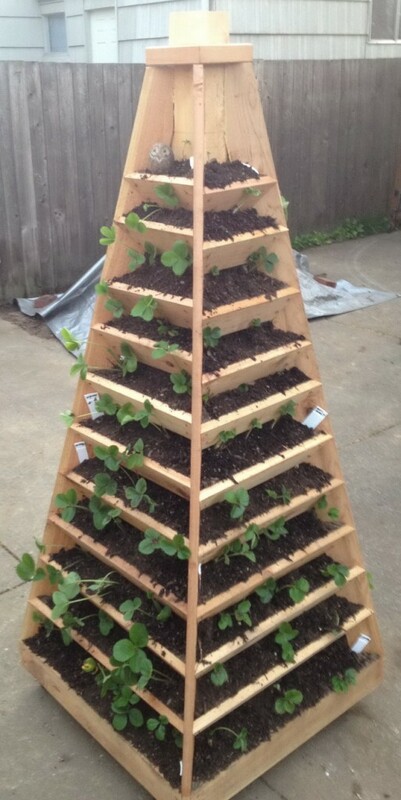 Clever use of space employed for growing everyone’s favourite berry; strawberries! Excellent use of vertical space by suspending guttering from the side of a pergola: part screen, part extra garden. Not just an efficient use of space but seriously attractive, too. 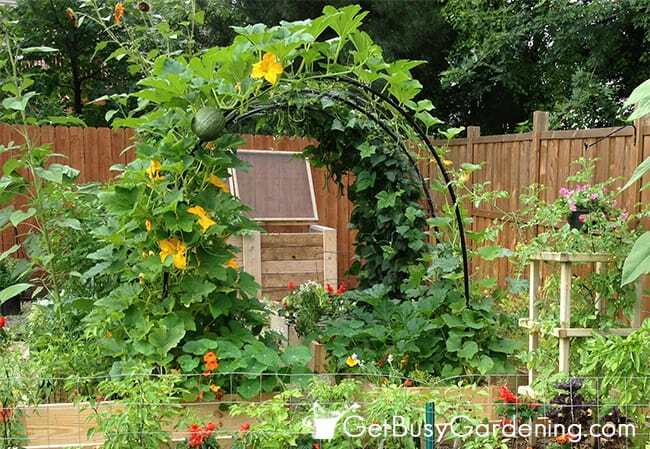 Add an extra layer to your small vegetable garden by growing sprawling plants over a hoop. What clever tricks do you use to grow vegetables in small spaces? Let us know in the comments. Remember to follow me on Pinterest and Facebook!